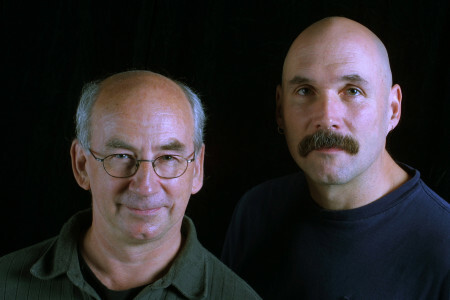 Living Cinema is the creation of Quebecois film maker Pierre Hébert and San Francisco composer Bob Ostertag. The project is innovative in many ways, bringing the creation of cinema out of the movie and recording studios and onto the stage. Ostertag has created innovative software which allows the two artists to actually perform an animated movie with soundtrack, live and in real time. For decades, Hébert was considered one of the masters of the unusual craft of creating animated films by engraving directly on film. Living Cinema allows him to apply the craftsmanship acquired through years of engraving on film to whatever materials he wishes to use. Ostertag brings his years of experience with live manipulation of sampled sound to the project, using a variety of objects and techniques to create a soundtrack that is synchronized with the image as both are being created. The flexible, open-ended character of Living Cinema gives the artists the ability to respond immediately to political and cultural events in a way that conventional cinema never could. The work is thus profoundly influenced by world events. Hébert creates images by drawing with markers on paper, chalk on chalkboard, blowing dust on mirrors, and manipulating piles of garbage. Lots and lots of garbage. The garbage is used as both the subject of the animation and the source of the sound. Ostertag records the sound of garbage food, and manipulates it by drawing shapes on a digital drawing tablet. Although technologically intensive, Living Cinema does not celebrate technology but questions it, and its relation to the bodies of performers and the world around us, and, of course, garbage. Today’s cutting edge technology is of course tomorrow’s garbage. This paradox is not banished to the shadows as an unspoken embarrassment, but is rather the starting point of the entire project. Ostertag and Hébert sit on stage and try to sense out of science and garbage — a more explicit rendition of the situation we all live in every day.